When your Subaru needs a new starter, don't splurge on a brand new starter assembly or put your vehicle at risk with shoddy after-market parts. 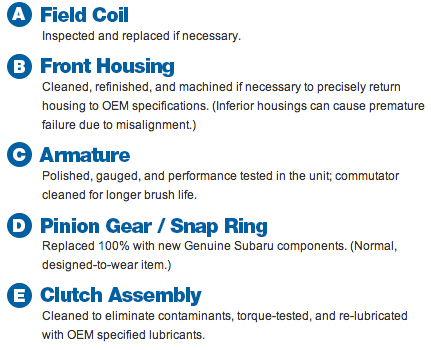 Instead, go with the completely rebuilt, like-new Subaru remanufactured starter. Subaru starts by taking apart the starter completely and thoroughly cleans it. Then, moving parts that need replacing are swapped out for new OEM components. Components that are vulnerable to corrosion like the solenoid cover are re-plated. Then, the reassembled starter must pass all the same tests and meet the same specifications as an originally manufactured starter. 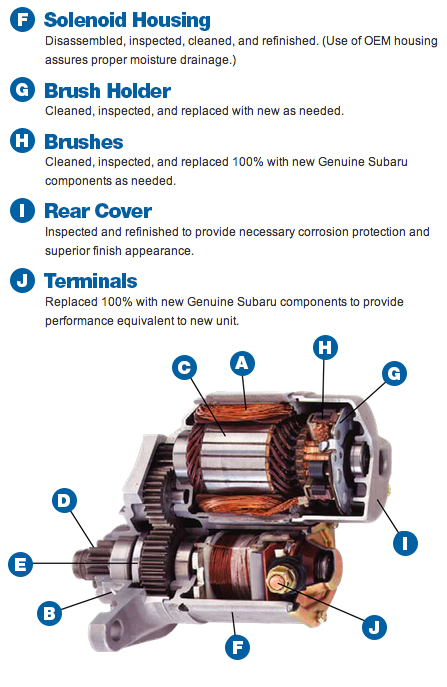 With those strict requirements in mind, you know you can trust a genuine Subaru remanufactured starter--have your genuine Subaru remanufactured starter installed today at Subaru Superstore.